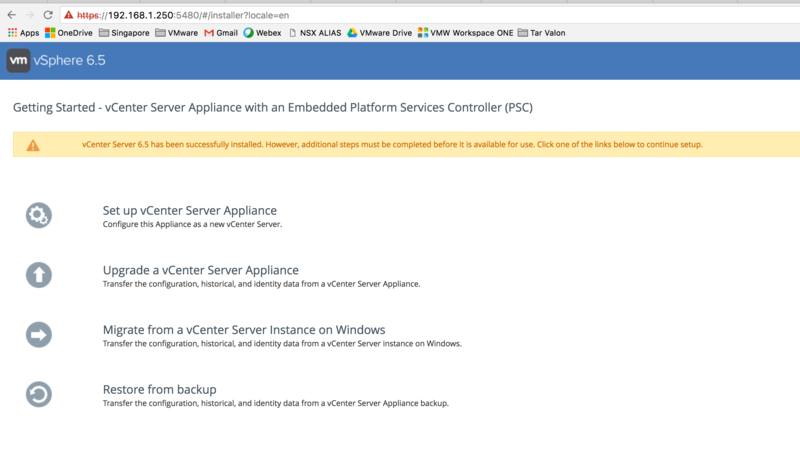 I previously wrote about how to install vCSA 6.0 to fusion here. You had to do things like append .ova to the vmware-vcsa file and the rest. Now in the 6.5 ISO there is a file that is already called this. Huzzah! It can be imported into VMware Fusion! Import this into Fusion like any other OVF file. Deploy it with the default settings or modified them if you like. Once deployed do not power it on. Browse to the VM location and explore the contents of the VM. Inside there is a VMX file. Note also in the 6.0 post I commented about the lack of VUM – well now we have it built in! ** CHECK THAT ” doesn’t turn into “ – this results in a “Dictionary Problem” when trying to turn on the given VM. Power On the VM and let it boot. You will be greeted instantly with a Photon boot screen. All VMware Appliances moving forward will use Photon as the base VM. This will allow for rapid security remediation, baseline adjustments and more! After some minutes – Voila! Server Appliance on Fusion. Once you set up vCenter you can choose three superb options – deploy a new vCSA, Upgrade from an older vCSA, or Migrate from Windows to vCSA. Lab away on the best way to deploy vCenter. Hi, Great article! But when I try to add the lines to the .vmx file and I want to start the VM, I get an error “The VMX is corrupt”. What am I doing wrong? I’ve putted the text on diverent locations in de VMX file, But no luck. Make sure that you have the correct “” around it and they have not been converted to talking marks.